Brooklyn, NY - A car accident that was labeled a simple hit and run by the NYPD has community leaders outraged, saying that it is yet another example of the 66th Precinct turning a blind eye to incidents involving Jewish victims. 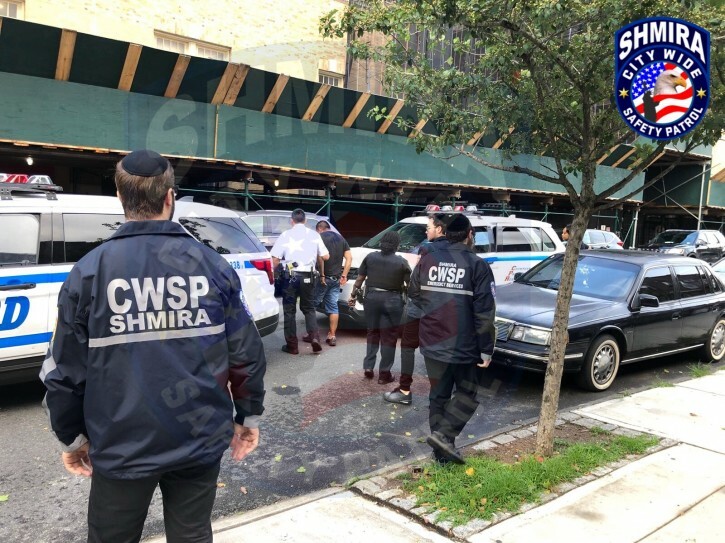 As previously reported on VIN News, two Jewish men and a six year old boy were injured on Shabbos afternoon when a minivan backed up on 56th Street, pausing momentarily to let a car pass through the 11th Avenue intersection before slamming into three Chasidic individuals standing near the sidewalk. After being contacted by family members of two of the victims, Shmira City Wide Safety Patrol canvassed the neighborhood for video of the incident and located the car parked several blocks away, keeping the car under observation throughout the night and calling the NYPD when the driver, Juan Paulino, emerged in the morning. Officers from the 66th Precinct arrested Paulino and charged him with leaving the scene of an accident. The charges were later upgraded to include reckless endangerment and leaving the scene of an accident with a serious injury, both felonies, as well as unsafe backing of a vehicle, a misdemeanor. Paulino reportedly told police that he had had an argument with some men who had just left his car and was attempting to follow them when the incident took place. 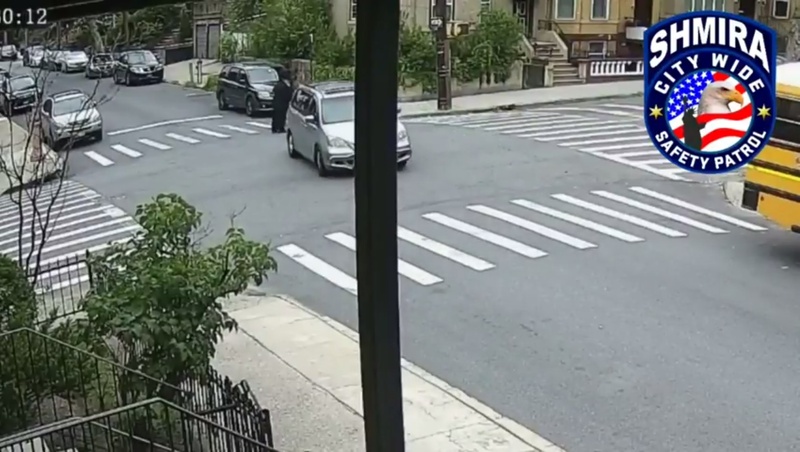 While originally released footage of the accident seems to show that Paulino intentionally aimed for the Jewish group, as yet unreleased surveillance video obtained by VIN News appears to support his version of events, showing his minivan parked at a bus stop. Several individuals can be seen exiting the vehicle and standing there briefly, before two men break from the group and start running down the block. Seconds later, Paulino’s car can be seen driving in reverse, casting doubt on whether he was aiming for the Chasidic group on the corner or was attempting to follow the men who had just left his van. Whether or not Paulino’s actions were deliberate, area residents are still rattled by the incident and the 66th Precinct’s lackadaisical response, said Rabbi Mordechai Kuten, one of three individuals who was struck by Paulino. Rabbi Kuten said that he was standing with his son talking to Shmiel Grossman, a friend and a former neighbor, after Mincha when he saw the minivan headed directly in their direction. The impact of the car pushed Grossman at least ten feet, according to Rabbi Kuten. Grossman was the most seriously injured of the three and remains hospitalized. Rabbi Kuten said that the car ran over his son’s thighs, leaving him with abrasions but no major injuries. The next few minutes went by in a blur for Rabbi Kuten who said that he cannot recall speaking to police at the accident scene but that he was later told that patrol officers from the 66th Precinct visited the scene only briefly. Rabbi Kuten spoke with police later that night in the hospital and even after saying that the car appeared to hit them deliberately, he was told it was nothing more than a hit and run and the driver would likely never be caught. Frustrated by what seemed to be a lack of interest in the case on the part of the NYPD, Kuten’s sons called Shmira, who spent Tisha B’Av night canvassing homes to get video, putting the details of the case together on their own, before handing the entire case to the NYPD on a figurative silver platter. The incident is demonstrative of what community leaders said they have been seeing over the past two years, with Borough Park’s Jewish residents seeing too many instances of inaction by the 66th Precinct in cases involving Jewish victims. The fact that the 66th Precinct never informed community leaders of the incident has left them with little response for concerned Borough Park residents. Jewish community leaders have reached out to their counterparts in other communities to discuss the situation, said Community Board 12 chairman Yidel Perlstein. None have reported similar experiences when dealing with the NYPD. Borough Park’s Jewish community isn’t looking for any favors from the NYPD noted Perlsetin. Again, to deliberately overlook the fact that he purposely turns his van squarely at the yidden, is willful blindness. Ever walk into a PCT to fill out an accident report ??? ?Oops ...don't want to upset our community leaders !!! I watched the video. Where do you see a hate crime.. Look how he drives backward down the block before he gets to the intersection. He was for sure high on something. Then in the intersection, it doesn't look like he knew who was hitting..
FOR SHAME, 66TH pct., FOR SHAME !!! this is happening elsewhere as well. Since the Scandals with the Askanim. the police don't want to deal with the Jews. We need mayor Rudy back not this clown Deblasio. How were you able to see that he knew that he was hitting RELIGIOUS JEWS? maybe all these "community leaders" and their bribes, hiring of zonos and other issues caused these already low life NYPD cops to avoid them. the 70th and 66th precints which cover the frum areas of Boro Park and Flatbush as well as the 77th in CH are known to be a place where the laziest of cops go, its better than going to the projects or the south Bronx. As I have been saying for years under de bozo crime is just not reported since it has to show its "falling", No police precinct will EVER pick up the phone, no one will EVER amend a police report, which is written by hand and stuck in the middle ages. the NYPD is made up of "diverse" cops who failed to be sanitation workers. Yeger wont do anything without his boss Greenfield saying yes, while the latter is making $50,000 A MONTH fighting poverty I kid you not. I have experience myself when I was threatened by an Arab youth with violence called the NYPD who said "they will send someone over when they are available" of course the perp fled and a crime didn't occur. 2 hours later 2 overweight female "cops" show up 1 AA 1 latino who said since I had no proof they could not help me, they said I should take the perp to civil court.